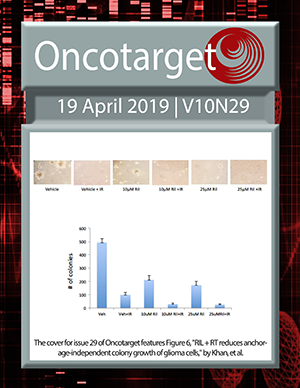 The cover for the November issue of Oncotarget was taken from a series of images showing the effects of miR-98 on cell activities. Pictured above is the GFP expression of anti-miR-98 cells. See Siragam et al. NRF2 and p53: Januses in cancer? Genes affected by mouse mammary tumor virus (MMTV) proviral insertions in mouse mammary tumors are deregulated or mutated in primary human mammary tumors. Residual malignant and normal plasma cells shortly after high dose melphalan and stem cell transplantation. Highlight of a putative therapeutic window in Multiple Myeloma? Identification of miR-30d as a novel prognostic maker of prostate cancer.